An innovative clinical trial using the science of "personalized" cellular therapy is treating older adolescents and adults suffering from Crohn's disease. Physician-researchers at Emory University and Children's Healthcare of Atlanta are harvesting bone marrow cells from older adolescents and adults (18 to 65 years old) with Crohn's – an inflammatory bowel disease – and manufacturing personalized cells to target the disease's inflammatory mechanisms, potentially reducing intestinal flare-ups and limiting long-term damage. 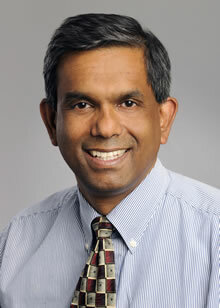 Subra Kugathasan, MD, Marcus Professor of pediatric gastroenterology at Emory School of Medicine and a physician with Children's Healthcare of Atlanta, is leading the clinical trial, which is supported by the Crohn's and Colitis Foundation of America and the Atlanta Clinical and Translational Science Institute. This study currently is offered only in Atlanta. Symptoms of Crohn's disease include severe abdominal pain, diarrhea, fever, weight loss, and the inability for a child to properly grow, resulting in bouts of inflammation that may also affect the entire digestive tract, including the mouth, esophagus and stomach. Available therapies designed to suppress the inflammation do not work in everyone, and bowel resection may eventually be needed. The recurrence of Crohn's disease after bowel resection is very high, highlighting the need for new therapies. "There is no current answer for what specifically causes Crohn's disease, nor is there a cure," says Kugathasan. "But we hope that through our clinical research, we will be able to significantly improve the course of this disease." Blood and bone marrow cells have been used for more than a quarter century to treat life-threatening hematological conditions and are now established therapies worldwide. The current clinical trial uses the patients' own mesenchymal stromal cells from the bone marrow. These cells have been studied by Emory investigators for treatment of autoimmune diseases. The Crohn's disease clinical trial is the first study launched in partnership with the new Emory Personalized Immunotherapy Center (EPIC) at Emory University Hospital and School of Medicine. No other study has so far combined the technologically innovative and FDA-regulated elements of the Emory and Children's study, says EPIC director Jacques Galipeau, MD. The personalized cells are derived from the patient's own bone marrow cells, as opposed to cells derived from an anonymous donor; the process of preparing the cells involves the use of animal-free products; and the cells are delivered fresh shortly after harvest. The manufacturing of the cell product is performed on site in a dedicated pharmaceutical grade facility within Emory University Hospital..
Other faculty physicians involved in the study are Tanvi D'here, MD, assistant professor of medicine (digestive diseases) and K.Y. Chiang, MD, associate professor of pediatrics (hematology) at Emory School of Medicine and Children's Healthcare of Atlanta. The new clinical trial is FDA monitored, and patients will not be charged a fee to participate. Patients have close medical follow-up after treatment, and all clinical and scientific data will be made public. For additional information about the study, contact the clinical trial team via email at IBDresearch@emory.edu or by calling 404-727-7049. Emory University is a nationally ranked research university with nine schools, including an undergraduate liberal arts college, a two-year liberal arts college, graduate school, and schools of business, law, and theology. The Woodruff Health Sciences Center (WHSC), an academic health science and service center focused on missions of teaching, research, health care and public service, includes schools of medicine, public health, nursing, Yerkes National Primate Research Center, Winship Cancer Institute, and Emory Healthcare, the largest and most comprehensive health center in the state of Georgia. Including health sciences, Emory University has a total of 14,236 students, 4,047 faculty, and 27,747 employees. Children's Healthcare of Atlanta, a not-for-profit organization, is dedicated to making kids better today and healthier tomorrow. Our specialized care helps children get better faster and live healthier lives. Managing more than half a million patient visits annually at three hospitals and 20 neighborhood locations, Children's is the largest healthcare provider for children in Georgia and one of the largest pediatric clinical care providers in the country. Children's offers access to more than 60 pediatric specialties and programs and is ranked among the top children's hospitals in the country by U.S.News & World Report. With generous philanthropic and volunteer support, Children's has made an impact in the lives of children in Georgia, the United States and throughout the world. Visit www.choa.org for more information. The Crohn's & Colitis Foundation of America (CCFA) is the largest voluntary non-profit health organization dedicated to finding cures for Inflammatory Bowel Diseases (IBD). CCFA's mission is to cure Crohn's disease and ulcerative colitis, and to improve the quality of life of children and adults who suffer from these diseases. The Foundation works to fulfill its mission by funding research, providing educational resources for patients and their families, medical professionals, and the public, and furnishing supportive services for those afflicted with IBD. For more information, visit www.ccfa.org, call 888-694-8872, like us on Facebook, or follow us on Twitter.